It is a carefully guarded recipe known only to four people. Only one of them is the "brew master." There are about 2.5 million gallons of the stuff manufactured each year. It gets its distinctive smell from a fragrance that is added to the brew. Ken East (one of the original founders) says there is nothing in WD-40 that would hurt you.The main ingredient is "Fish Oil." It's the first thing that has ever cleaned that spotty shower door. If yours is plastic, it works just as well as glass. Then try it on your stove-top and it will be shinier than ever before. Gives floors that 'just-waxed' sheen without making it slippery. Gives a children's play gym slide a shine for a super fast slide. Cleans and removes love bugs from grills and bumpers. The favorite use in New York--WD-40 protects the Statue of Liberty from the elements. 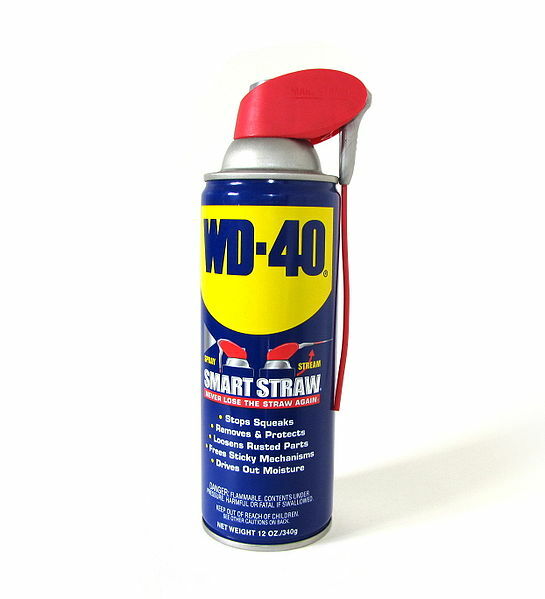 WD-40 attracts fish. However, be careful as laced baits or lures for fishing are not allowed in some states. Removes crayon from walls. Spray on the mark and wipe with a clean rag. Apply on clothes before washing to remove lipstick spots. If you are having problems starting your car, spray on the distributor cap to displace moisture. It helps remove black scuff marks from the kitchen floor. Just remember to open some windows if you have a lot of marks.